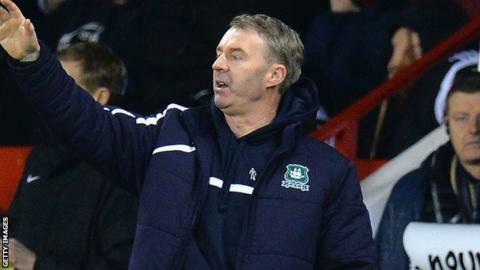 Plymouth Argyle manager John Sheridan has said he expects his side to win the League Two play-offs. The Pilgrims host Wycombe, who finished 13 points ahead of them, in the first leg of their semi-final. Wycombe missed out on automatic promotion by a point and have the best away record in the Football League this season. The Devon side ended the regular season with two victories to pip Luton to seventh - the final play-off spot. When the teams last met in February, Plymouth beat Wycombe 2-0 at Adams Park. "I don't see any favourite whatsoever in the play-offs - all four managers will be saying they can get through," added Sheridan. "They won't be looking at who's finished higher, who's got more points or who won the last time they played each other - everyone's at an even keel."